2€ Juhlaraha Vatikaani Fatima 2017. In 67 AD Peter and Paul were martyred in Rome. Peter was crucified upside down and Paul decapitated, a distinction reserved to Roman citizens condemned to death. This year marks the 1,950th anniversary of the martyrdom of the two Saints on whose faith, Pope Francis reminds us, “was founded the Church of Rome, which has always venerated them as Patrons. They proclaimed and witnessed to the Gospel among the people, and with their martyrdom they sealed their mission of faith and charity”. 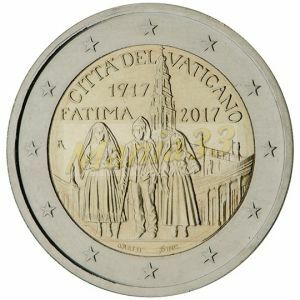 With illustrations by Gabriella Titotto, the coin shows the profile of the two Saints along with the two symbols that have always characterized them in iconography: the keys and the sword. The first symbol is an explicit reference to what Jesus conferred to Peter, the keys “to the kingdom of heaven” (Mt 16:13-20). The second symbol refers to the life of Saint Paul, persecutor of Christians before his conversion and martyrdom.